Using Apache Environment Variables in .htaccess files with RewriteRule, SetEnvIf, Header, etc., is made easier by having a script that displays current variables and environment. 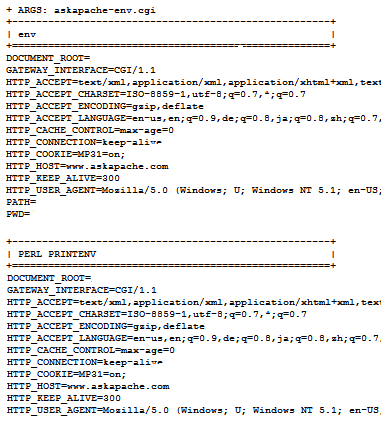 Heres my slightly improved version of the common printenv and test-cgi scripts that come with Apache Installations. If IP is not allowed it will redirect to any page you specify. ### This work is licensed under the Creative Commons Attribution 3.0 United States License. ### San Francisco, California, 94105, USA. ### See https://www.askapache.com/about/disclaimer-and-license/ for info. ###   Place in public web directory request from your web browser.